We’re picking up with day 2 of my Cape Cod adventure. To read about day one, click here. The nice thing about Cape Cod’s super early last call is that I was able to get a good nights sleep pretty much everyday, and didn’t wake up at all with a hangover, which is pretty monumental for a vacation. We’d already decided that Friday was going to be our beaching on the cape day, as we’d be departing for Martha’s Vineyard early that next morning. 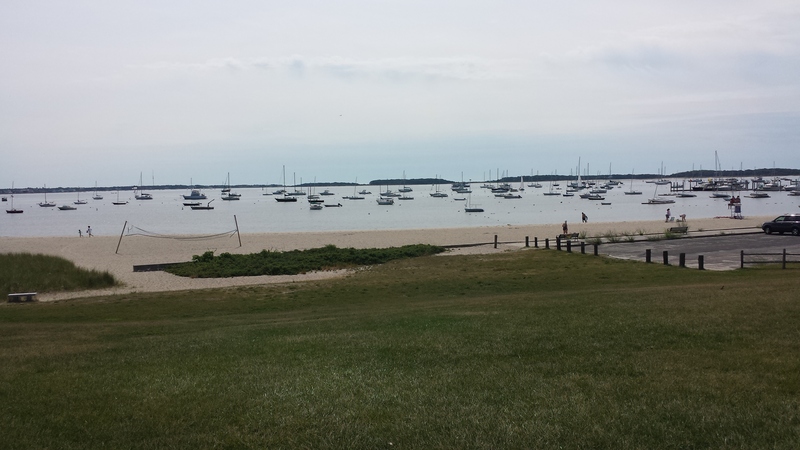 Our bartender at the 19th hole had recommended Mayflower Beach, about a 20 minute ride on the bayside of the Cape. 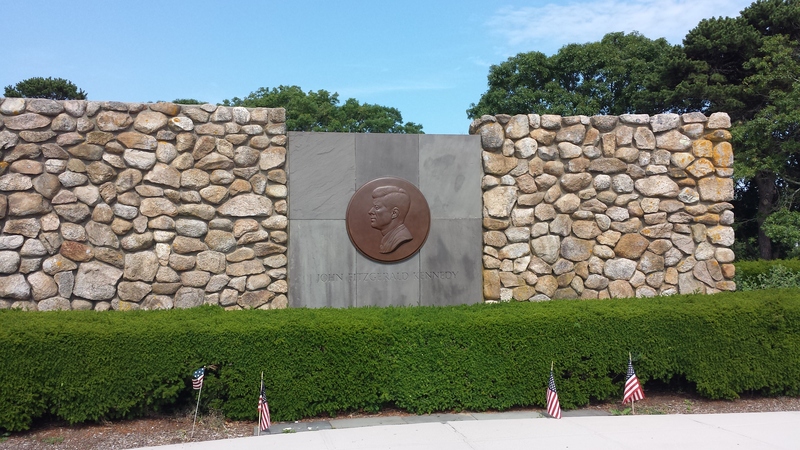 We got up, I grabbed Dunkin Donuts (while the other bums slept in) and took a quick detour to the JFK Memorial before heading to the beach. The JFK Monument, overlooking Hyannis harbor. The Mayflower Beach was nice enough, but be forewarned that if you’re going to Cape Cod, you’ll most likely be shilling out a pretty penny to use its beaches. Now, there wasn’t a charge for the beach per say (like there is in Jersey), but we did have to shill out $30.00 to park (not terrible, but something to be on the lookout for). It was a nice day and the beach was semi crowded, so we set up our blankets and lounged for about two hours. My one complaint about the Cape Cod beaches, is that the waves are pretty weak. A non-complaint is that at Mayflower Beach, and I found this to be true at the beaches on Martha’s Vineyard as well, the water close to shore is the bright blue color reminiscent of a more tropical locale, which makes for very picturesque, if not cold, swim. Mayflower Beach was also the first place on the trip that I slipped up with my sun exposure, fooled, like an idiot into thinking that the sun was not strong because it was semi-cloudy (which is literally the first fact about the sun in every skin cancer article). Since we’d arrived at the beach around 10:30, by two were completely starving and so set out to find some food. We stopped at the Cape Cod Brewing Company, right on the outskirts of Hyannis, and I was all set to sample some beer, but by that time we were so dehydrated that we opted out of that in lieu of several bottles of water. 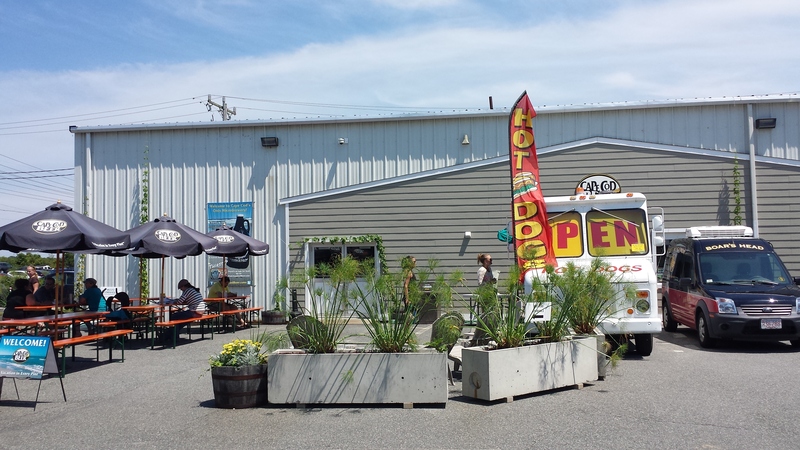 The Cape Cod Brewing Company has a nice little set up, with outdoor picnic tables and bean bags set up sporadically. They also had a food truck, but non one of those trendy ones serving tacos made with locally sourced ingredients. No. They had a hot dog truck with $1.50 hot dogs. That’s my kind of place, and embarrassingly enough, I ate six dollars worth of their products. They also served super cheap fries, nachos, and the abomination known as the walking taco. I’m not picking on this food truck in particular, as walking tacos are not their special invention. I’ve encountered these culinary travesties before, and get disgusted everytime. Essentially, one takes a bag of fritos, pours in chili or taco meat, and then walks about eating it with a fork. I’m not sure why I’m so disgusted by these, but there were two small children walking around with the taco meat smeared all over their faces, that kept me gagging. My sister kept threatening to get one, but luckily didn’t follow through. They have a really cool gift store too, and I’m bummed that at the time, I had no cards on me. Cape Cod Beer-all I saw was the hot dog banner. On our way back, we smartly stopped for some beer and food, as we figured it’d be very expensive once we were out on the island. 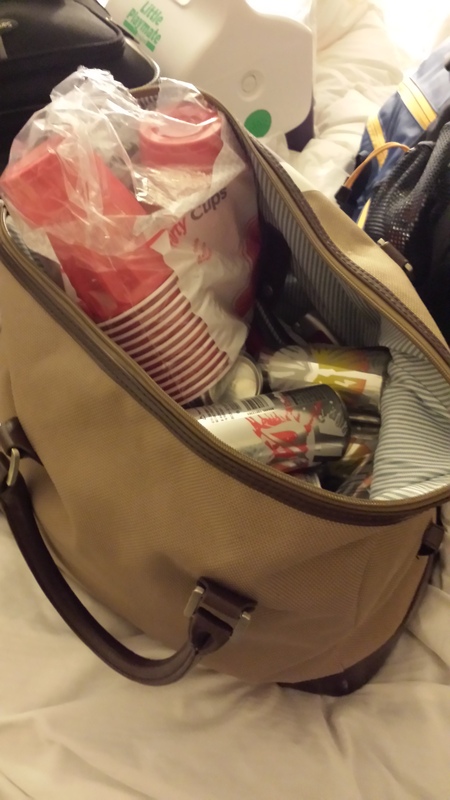 All packed for the ferry ride! After returning to the hotel to find that I only had a starter burn, we took a quick dip, and then got into the car to head to Plymouth, where we were meeting our cousin Mary, who lives outside Boston, for dinner. This is the same Plymouth where the Pilgrims and Indians cooked turkeys and apple pie together, all whilst stuffing cornucopias with gourds to celebrate friendship, so many years ago. While we were only there a short while, I have to say that I was impressed with Plymouth. It’s a pretty happening little oceanside town, and while visiting their website prior to publishing this post, I found that it’s also home to its own brewery and distillery, so that had we had more time, and not had to drive back forty minutes to Hyannis, we could have done a little first Thanksgiving bar crawl. 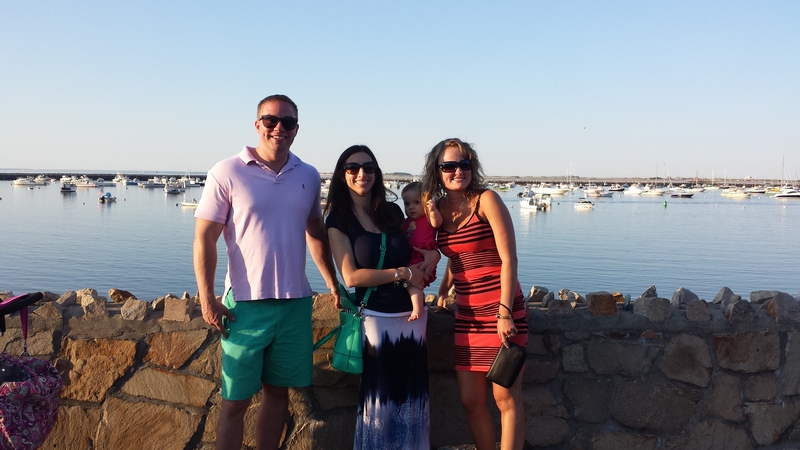 Family picture in Plymouth-notice that I’m starting to look a little too sun-kissed. We ate at the East Bay Grille, a pleasant enough dining establishment right on the water-the real attraction here was visiting with Mary, and her new baby Aubrey. After dinner, we took a stroll along the waterfront to see Plymouth Rock, the stone which allegedly the Mayflower first landed at. You hear a lot about the Mayflower, Plymouth Rock, and Plymouth Plantation as a kid in school, so if you, like me, are picturing something imposing (I was actually picturing something akin to Pride Rock jutting out into the sea), then be prepared to be disappointed. Rock is apt term. Stone might even be better. It’s small, especially in comparison to the ornate pavilion it’s housed in. 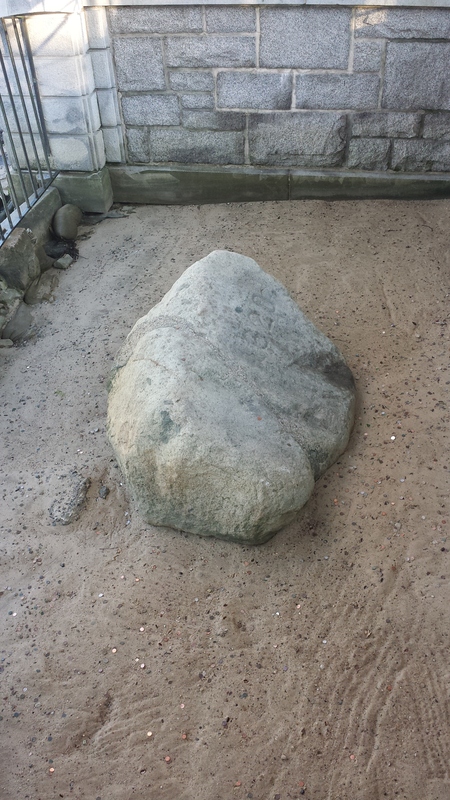 The is Plymouth Rock. This is it. 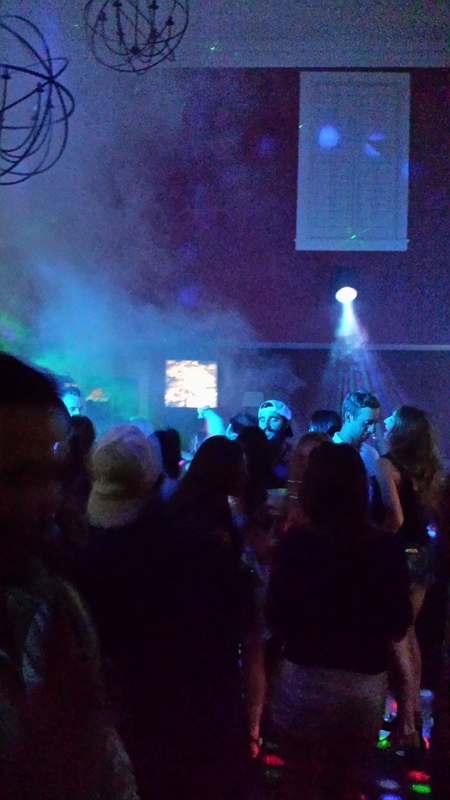 Friday night, we went back up for our second and last dose of Hyannis nightlife. More Naragansett, more 19th Hole (not enough of either, in my opinion) and a trip to a bar whose name did not stick with me, but who I’ll simply dub “da club,” as I didn’t think they had beachside establishments of this nature outside of New Jersey. It was another early night, and my sister, Kristal, and our other two friends who’d joined us that night stayed up pretty late carousing in the hotel room, but since I’m old and all, I fell right asleep. Party in da club. Not my scene.